Thank you for visiting our webpage! As you continue exploring our program, I believe you’ll find that we have something special to offer you as a student and our commitment to you continues long after you launch into your future career in the pharmacy profession! 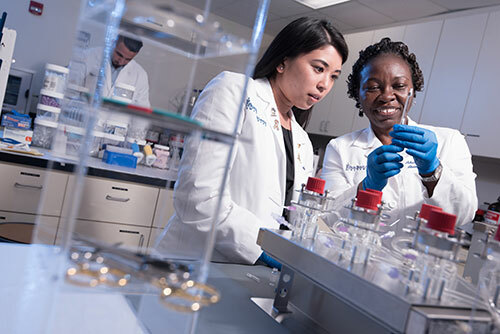 Faculty: Our faculty members are experienced educators who come from a variety of professional backgrounds including drug development, hospital, independent pharmacy management and more. Class Size: We are committed to maintaining a small class size that allows students to access our faculty members, which maximizes opportunity for academic success and nurtures their passion for a profession that is geared toward saving lives. Faith: As a Christ centered program, it doesn’t at all surprise me to hear employers and preceptors say that there is something extra special about our students. Regardless of a student's faith background, our emphasis upon spiritual vitality empowers students to address moral and ethical issues encountered on the job like no other. There are many factors you must consider as you enter into this exciting new chapter of your career. As the Director of Admissions, I strongly encourage you to see first-hand what makes the Lloyd L. Gregory School of Pharmacy special by scheduling a visit today. If you have any questions about the admissions and the application process, please call (561) 803-2750 or by e-mail. Why are there so many deposits? What if I am unable to pay the deposit? I heard that there was a Facebook group for my class. How can I be added to the group? Are there any additional fees on top of the tuition? Are books included, if not, how much should I expect to spend? Now that I have been accepted, when do I get my intern license? When do I start rotations? I am interested in research, what kinds of opportunities are available at PBA? Are there special parking arrangements for Pharmacy Students? What is the estimated cost of living per year? Do you have any housing recommendations? What type of insurance coverage is required by Palm Beach Atlantic University? I am an international student. Will the school help prepare my student visa (F-1)? I am an international student. Can my spouse come to the United States with me? I am an international student. Can my family visit me during my studies? There are a total of two (2) deposits due. The first deposit of $750 is due within two (2) weeks of being awarded an offer and the second deposit of $250 is due on June 1. 2. Why are there two deposits? While the amount we require to reserve your seat remains the same, we divided the payments into two due dates to help alleviate the initial expense of one large deposit. This also assists in maintaining an accurate class count. 3. What if I am unable to pay the deposit? If you are unable to pay the deposits, please contact the admissions office to arrange a payment plan. Payment plans are considered on a case-by-case basis, however we will try our best to accommodate you. 4. What form of payments do you accept? After acceptance a link will be e-mailed for you to create an account to pay the deposits. This will also serve as a means to communicate important information. If you are having difficulties creating this account, please call admissions at (561)-803-2750. 5. I heard that there was a Facebook group for my class. How can I be added to the group? After you have formally accepted your offer and paid the first deposit, the admissions office will send an invite to your email on file at PharmCAS. If the email you use for social media is different than the one we have on file, please notify us via email so that we can add you to the group. 6. Are there any additional fees on top of the tuition? Yes, in addition to the tuition, there are lab fees and a small university fee each year totaling approximately $400. 7. Are books included, if not, how much should I expect to spend? Books are not included in the tuition. The cost of books will vary from semester to semester. Some courses may not require books. While others may require a book, in those instances, used books and electronic copies may be purchased to save on cost. Many books are included through the drug information center (electronic versions only). 8. Now that I have been accepted, when do I get my intern license? Your intern application will be emailed to you during the summer. It will be processed after the start of fall classes to ensure that you are a pharmacy candidate eligible to receive the license. 9. When do I start rotations? Your first rotation (IPPE) will take place during the spring semester of your P1 year and will be in a community/retail pharmacy. Then you will continue to complete a series of rotations until your fourth year. During the fourth year you will have 10 APPE rotations before graduation. Yes, you must complete the required rotations to maintain your candidacy. 11. I am interested in research, what kinds of opportunities are available at PBA? Many of our students and faculty members are actively involved in ongoing research projects. A faculty research forum is held each spring highlighting the various research topics and potential options for student collaboration. There are also paid student research opportunities in the summer and a student organization that is geared towards students pursuing careers in the industry and the research realm. 12. Are there special parking arrangements for Pharmacy Students? There are designated areas for “future student” available for you to park while visiting our school. Once you become a student you will register for a parking decal that allows parking in all available lots, including the parking garage. 13. What is the estimated cost of living per year? The estimated cost of living varies depending on location. One can expect rent to be above $1,000 for a luxury unit within the downtown area. If you are willing to drive 10-15 minutes to school, rent can range from $400-$800 depending on the number of roommates. Cost on food and gas depends on the lifestyle you chose to live. 14. Do you have any housing recommendations? Housing availability changes from month to month. Recommendations will be listed on Facebook as it becomes available. However, it is your responsibility to contact the landlord to secure the lease. Students can also utilize the Facebook page to find roommates. Immunizations are required for all pharmacy students. New students will be sent information on immunizations prior to the start of classes and will load these records into a software for preceptors to access as needed. 16. Is a physical exam required? Pharmacy students are required to participate in annual physical checkups to verify their health status. Physicals maybe completed by any clinic or Physician of your choice. This is for the safety of our students and the patients. 17. What type of insurance coverage is required by Palm Beach Atlantic University? General health coverage is required by the University. PBA offers medical coverage or you can opt out and use your own medical coverage. Your insurance must cover at least clinic visits and emergency hospitalizations. For more details, please check with our Health and Wellness Department. 18. I am an international student. Will the school help prepare my student visa (F-1)? Yes, after you have been interviewed, offered, and paid the deposit; the admissions office will work with you to either transfer or apply for a student visa. Keep in mind that you must pass the interview with the Consulate and be approved for a student visa prior to the start of orientation. 19. I am an international student. Can my spouse come to the United States with me? Spouse and dependents may travel on an F-2 visa. They may stay in the United States, as long as the student maintains their student visa status. For more information, please check with the Department of Homeland Security. 20. I am an international student. Can my family visit me during my studies? Your family may visit you throughout your studies at Palm Beach Atlantic University. Keep in mind they must obtain a tourist/visitor’s visa. Visas may easily be approved for Covenant, Hooding and Graduation Ceremonies pending their interview with the Consulate. For assistance, please contact the Gregory School of Pharmacy.